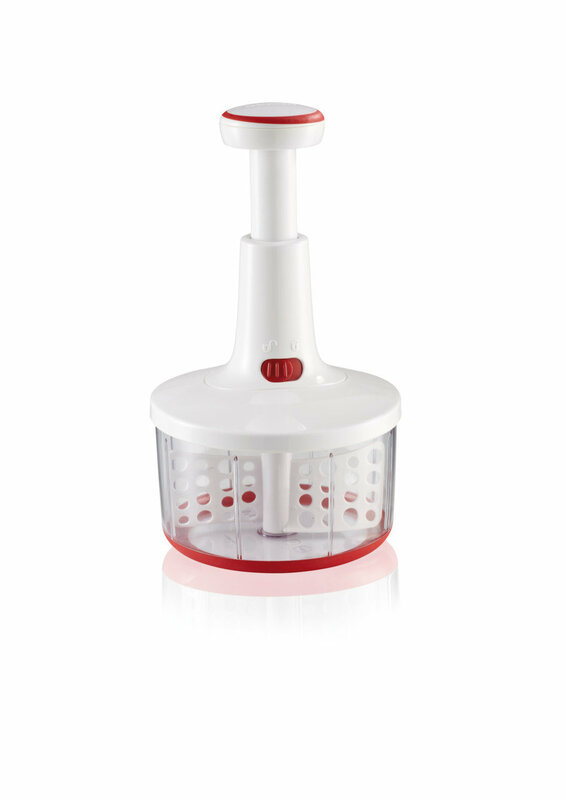 The mechanical kitchen aid Leifheit Twist Cut is a real innovation: it works as effective as an electrical food processor, but as easy as a child’s spinning top. Its extra sharp cutting inserts chop vegetables, fruits and herbs in a matter of seconds – individually from coarse to fine. When whipped cream or a delicious dressing is needed, the easy removable stirring insert is to be used. The Twist Cut changes into a practical stirring device. In contrast to conventional food processors it needs no electricity. A large 1-litre container enables the preparation of whole dishes like salads, dips, spreads, desserts, ice cream and even baby food. An enclosed recipe book offers delicious ideas. Particularly practical is the lockable lid. Prepared meals or leftovers can be stored in the refrigerator without transferring. The drive can be removed from the lid. Therefore the lid can easy be cleaned and it is dishwasher-proof.